Light of Dawn is an absorbing tale! This series has riveted me from the very beginning, and I quickly became invested in the characters and their journeys. Chapman enthralls readers with a chilling and conceivable story of survival, but even amid danger and despair, faith and hope shine. 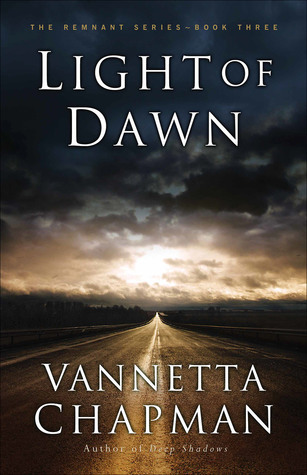 Light of Dawn is a thrilling conclusion to the Remnant trilogy, and I couldn’t put it down! For nine months, since a devastating solar flare caused a complete failure of the electrical grid, Shelby Sparks and her diabetic son, Carter, have been living at the ranch of Shelby’s high school sweetheart, Max Berkman. Mostly insulated from the chaos surrounding them, Shelby and Max discover that the Texas government has fled the capital and is barely maintaining control of the state. The governor needs volunteers to search for the new federal government, but no one knows exactly where it might be located—if it even still exists—or what perils await those brave enough to take on the mission. Compelled by Carter’s desperate need for insulin and their God-given sense of duty, Shelby and Max answer the governor’s call and set out on a treacherous 600-mile journey, where they will experience the terrifying effects of unrestrained anarchy. If they have the faith and fortitude necessary to reach their destination, what will they find when they get there?